We landed in Zurich safe and sound and on time, unfortunately with one of our bags a little lighter thanks to British airport security. More on that later. T slept through the meal on the last flight, so she decided she needed a McDonald’s fix on our way to our apartment. She got a double-cheeseburger and a small fries….for $9. And, no, this wasn’t an airport McDonald’s. We arrived at SFO Monday morning with plenty of time until our flight. We just checked in one bag and carried the rest. We stopped by the Admiral’s Club in Terminal 2 and I took a quick shower before the flight. The flight was just fine and pretty much exactly what I expected. This was technically our first time in domestic U.S. first class with the big, comfy seats, but we’d been in a few short-haul international business class flights on similar planes with similar seats. Apart from the food and service, it was pretty much the same experience. After landing in Dallas/Ft. Worth, we used the airport trams to make our way over to Terminal D, which is where our flight to London would depart. Terminal D also has a Minute Suites “lounge”. I’ll review it in a separate post, but the idea of Minute Suites is a private room for up to 3 people for $28/hour. OR if you have a Priority Pass lounge membership, you get your first hour free. If you have multiple memberships (we have 3), you can stack the hours. Three hours was plenty, though. 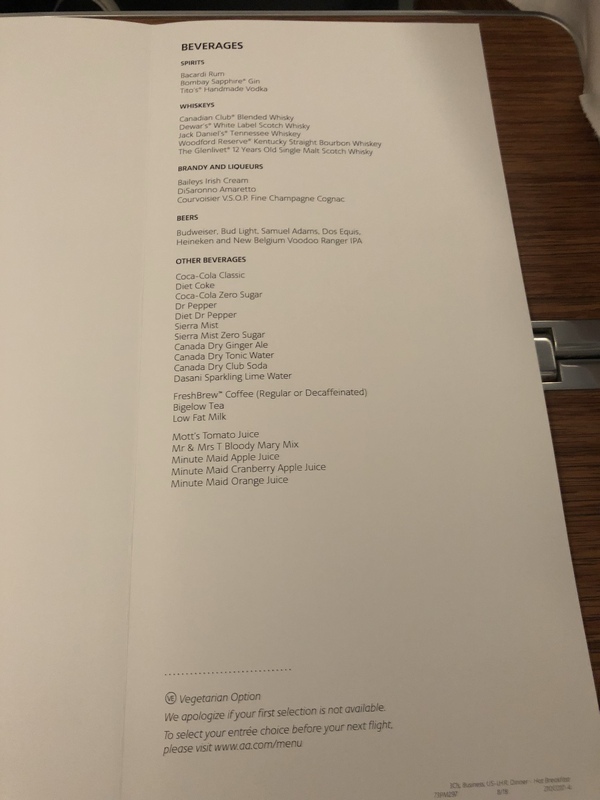 Our total layover was about 6 hours, so getting ourselves to Terminal D and napping in the suite for 3 hours gave us just enough time to head over and do a quick stop-in at the American Airlines temporary Premium Lounge. It was decently spacious, with plenty of snacks, drinks, and a small selection of hot food. They also had a quiet room, which I can see being useful when the lounge is crowded. After snacking on some Shin ramen bowls, we headed over to our gate just before boarding time to see if we could sneak on a little early to get some pictures of the plane before it got crowded. The gate area was your standard gate debacle with everyone standing up and crowding the entry way. It also didn’t help that boarding started about 20 minutes late. The desk agents kindly let me board early to try to get some empty plane pictures. Once we boarded, we quickly took as many pictures as we could before the plane was overrun, but even being one of the first to board didn’t get me as many empty shots as I wanted. 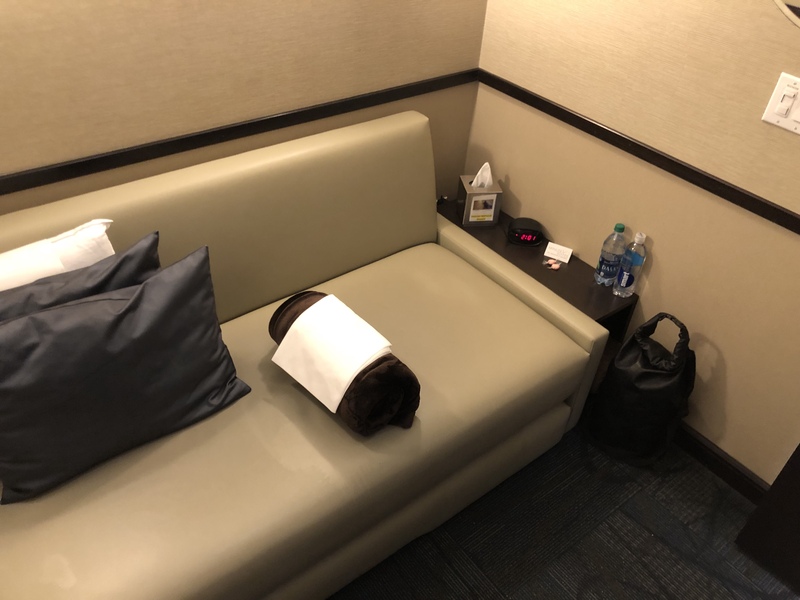 While AA doesn’t offer pajamas on this route, you do get a pretty comfy pillow and a very comfy Casper branded blanket. You also get to borrow a pair of noise-canceling Bose headphones. 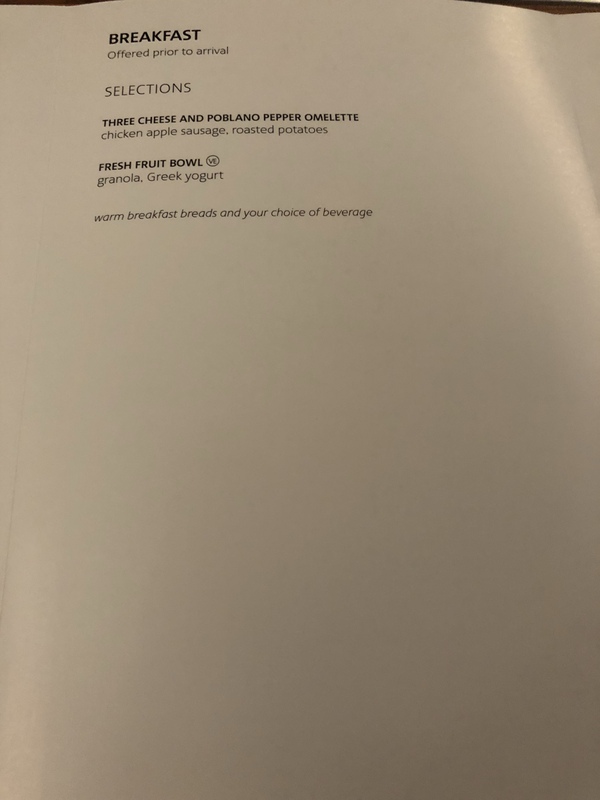 The meal service began about an hour into the flight. 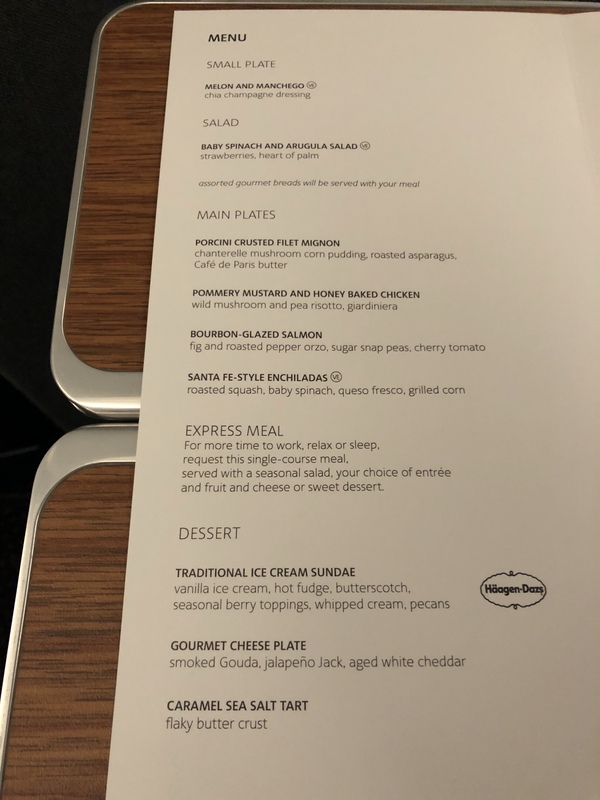 We both pre-ordered the filet mignon online, but for some reason, both of us felt like salmon once on the plane, so we switched. It was good and I’m glad they served the glaze on the side. Both appetizers were better than I expected and I went with the ice cream sundae for dessert. It was delicious, of course. Anyone that messes up a simple ice cream sundae should be shot. After dinner, I read a little and tried to get some sleep, which is usually tough for me on a plane. In coach, I wake up every 15 minutes to an hour with a sore neck and/or back. Even with a flatbed seat, the best I do is 2-3 hours, but at least it doesn’t hurt. Somehow I managed to sleep about 5 hours straight on this flight, which was awesome. We slept through breakfast and woke up with about 45 minutes left until landing. We didn’t make up much time in-flight and landed just about 20 minutes late. Not a big deal – I just figured it would eat into our lounge time. We had to bus to our terminal, but we got a skip-the-line voucher, which saved us from waiting for the next bus. We didn’t anticipate it, but we had to go through security again in London where we soon found out that we were only allowed to bring through a 1-liter, 20cm x 20cm-sized bag of liquids. This led to us having to go through all of our liquids and chuck a number of liquids/creams that we brought, which thankfully ended up being mostly mini-lotions and shampoos we got from hotels. So, between late flight, bus to terminal, and security check, we had to skip a lounge visit. At least we know now that it doesn’t matter if your liquids are in 3oz containers – you can’t carry a billion of them with you. The real slap in the face is that we could’ve stuffed them into the checked bag if we had known. Oh well. We do now and knowing is half the battle. Go, Joe! This gate situation here was a bit more orderly and we boarded and took our seats quickly. Like I expected, they’re just coach quality seats with the middle seat blocked off for more room. They served a light meal – I chose the chicken salad over the mozzarella tomato sandwich, which was decent. There was no in-flight entertainment on the plane, so I just read for most of the flight. We landed and were one of the first 10 people off the plane, which is nice when you’re trying to be first in line at immigration. Neither Global Entry, nor TSA PreCheck mean anything to the EU and we didn’t receive any kind of skip-the-line voucher that some airports do for premium cabin flyers. Well, being first off the plane doesn’t matter much when you walk off and 30 seconds later you all reach a locked door that doesn’t get opened for 25 minutes. Anyways, 45 minutes after that, we were through immigration and on our way to our Airbnb. All-in-all, the travel was enjoyable for me and T made it through without dying. It still hasn’t hit me yet that we’re not going back to the U.S. in 2-3 weeks.